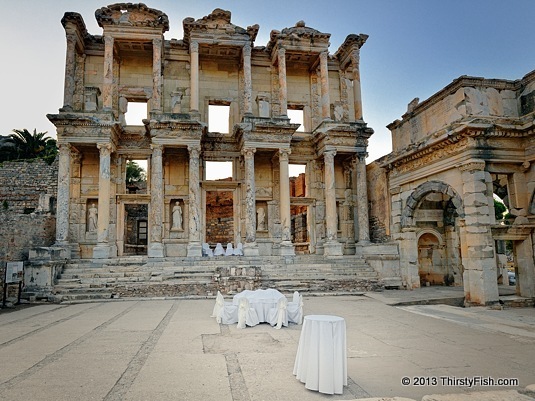 The Library of Celsus at Ephesus was constructed in honor of the Roman senator Julius Celsus in 117 AD. The library had the capacity of more than 12,000 scrolls and was the third largest library in ancient times after the Library of Alexandria and the Library of Pergamon. The Corinthian order facade houses four "virtue" statues, wisdom (Sophia), intelligence (Ennoia), knowledge (Episteme) and excellence (Arete). Celsus himself is buried in a sarcophagus beneath the library, in the main entrance. The earthquake destroyed facade was rebuilt, true to the original, in the 1970's.